We may be questioning ourselves and second-guessing plans today. It’s a time for making adjustments. The Moon is in Gemini until 12:25 AM. The Moon is void until 12:25 AM (since 1:37 AM yesterday). 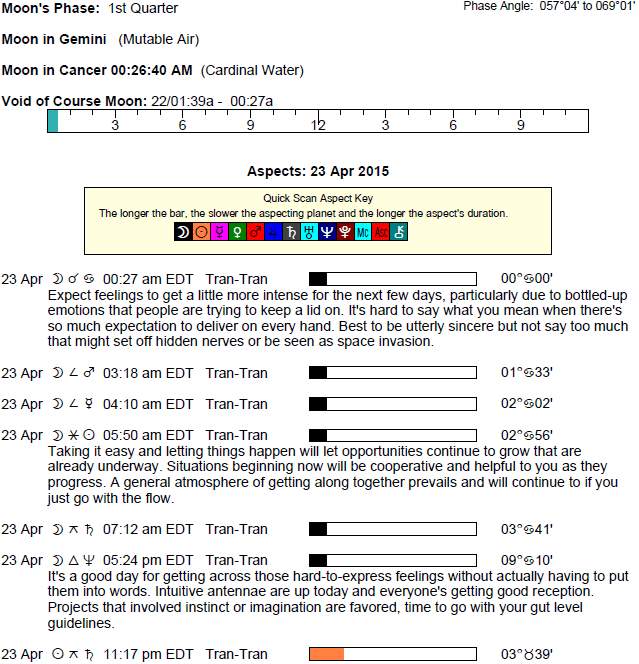 The Moon is in Cancer from 12:25 AM forward (until Saturday, April 25th, at 9:12 AM). The Moon is waxing, and is in its Waxing Crescent phase. 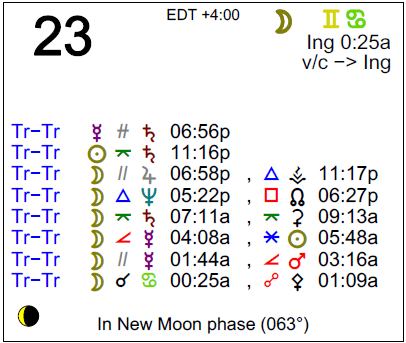 Today’s energies are complicated for practical affairs, Aries. Go over documents and communications carefully before finalizing them. It’s not a day for new beginnings, but rather one for making adjustments and important edits – ones that may be ignored or overlooked on other days. Decision making can certainly suffer, but it’s largely because you’re not ready to form a bottom line. Minor financial or legal complications are possible right now, and your outlook may be on the negative side. It’s important to take things step by step today and to focus on priorities and essentials. Others don’t readily let you have your way today, Taurus, which can be frustrating, but possibly a blessing in disguise. Slowing down is important now. There can be a responsibility to fill that comes out of left field, or a feeling that you’ve neglected one, and for some of you, concerned that someone is disapproving or keeping something from you. The need to make adjustments to your plans can be especially annoying after a few days of relative free sailing, but they can in fact be vital to success. Make edits, refinements, or simply wait things out. You might feel a strong desire to be on your own or to take some extra down time today, Gemini, but others may be calling you out on promises or simply pushing you to be involved. This is a time of year for identifying the deadwood in your life and letting go of bad habits and attitudes. It can also be a time for wrapping up projects. However, you also need more personal space in order to do all of this, and others may not be very sensitive to this need right now. The Moon moves into your solar second house today, however, and this tends to have the effect of steadying emotions and getting you into a rather practical frame of mind. Problems encountered now are simply reality checks, Cancer, and slow you down enough to make important refinements. Some social awkwardness is likely today, so if you can, avoid scheduling important interviews, events, or even serious conversations for now. Timing is off. However, the Moon moves into your sign very early today and finds nice channels for expression, suggesting you might be able to express yourself rather freely despite the social and work hiccups. You may feel a little out of the loop in your relationships, but you can be very much in tune with your own feelings and coming to interesting conclusions. The Moon moves into your privacy sector today, Leo, making it quite natural for some form of withdrawal or emotional renewal. Your initial instinct might need some refining before taking action today, as energy is complicated now. Avoid mixing personal and professional matters. While work, studies, or family obligations can feel burdensome, you also have opportunities to grow through your experiences. While the desire to escape is strong, you’ll be better off trying to make peace with the past. Recent days have found you feeling freer and more confident, Virgo, but today you could be feeling hesitant or uncertain. Alternatively, family responsibilities may seem to block your plans. With the Sun in your adventure sector, you are letting more spontaneity into your life, but Saturn is forming an awkward angle to the Sun today, reminding you of your limits and duties. While you could be feeling quite weighed down by a reality check of sorts, these checkpoints are important times for slowing down long enough to see where you may be making errors. While there has been very take-charge energy with us recently, Libra, today might be thought of as a time for making refinements to our plans and adjustments to our lives. Conversations may not be especially satisfying, as they can be a little too analytical or critical. Do your best to observe rather than jump into new endeavors and important conversations. Also, if you catch yourself criticizing when you could be doing something more constructive, try to tame the urge. Use your enhanced ability to see flaws for good use. Socially, your life has been picking up pace recently, Scorpio, but don’t read too much into today’s apparent slowdown. You could be second-guessing a partner, a plan, or even yourself. Try to use this temporary block as a chance to catch your breath, as well as to come to a more realistic assessment of a relationship or project. You may need to first entertain an overly negative point of view in order to get to the middle ground. Don’t let insecurity prevent you from opportunity, but do wait for a better day to actively pursue your desires. While the day is complicated and timing can be off, it’s a good time for thinking in new ways and for taking a break from the action in order to rethink a few things. You could be second-guessing yourself or your ability to handle your work or daily affairs effectively just for now, Sagittarius. You might temporarily feel motivation or energy levels wane. Timing may be off in general. While this is not an ideal day to elect for a new endeavor, important conversation, or interview, it’s a good time for getting assorted things done. You are seeing the flaws now, and this helps you to know what needs fixing before you move forward. There can be more of this type of energy while Saturn is in your sign, and it’s helpful for getting your life into smoother running order. There has been more courageous and confident energy with you in the last few days, Capricorn. Try not to let today’s somewhat challenging or awkward energy discourage you. Instead, let it slow you down long enough to make important refinements and adjustments to your plans. There can be some matters to handle from the past that need your attention, or feelings of guilt and unrest to deal with. Children or a romantic partner might be a little difficult to please, or you could find insecurity or responsibility prevents you from doing what you want to do and expressing yourself openly and naturally. While the last few days have been forward-looking, Aquarius, today brings more responsibility or a reality check of sorts. Current blocks, while temporary, do point you in the right direction in terms of what types of adjustments and edits you need to make. When Saturn is challenging, as it is today, it’s better to keep a lower profile, do things by the book, and work through your duties as best as you can rather than attempting to break new ground or start things anew. You may want nothing more than to stay at home or keep to yourself today, but the outside world and duties call you. Relationship bumps and bruises may be in the mix today, but it’s best to be flexible. Recent days have likely been quite focused and smooth, Pisces, but today, you are more likely to slow down and possibly deal with some blocks, whether these come from bad timing or poor planning. While it’s too easy to focus on what’s not working in your life at the moment, better use of your energy would be to work on straightening out problems and details. You could be especially interested in working on your pet interests and projects, but outside duties tend to call. It’s not an ideal day for getting support or gaining cooperation from others, and it’s important to watch for what you say in professional arenas. If Your Birthday is April 23rd, If Today is Your Birthday full horoscope here. A reality check prompts us to make adjustments. Sabian Symbol: A woman airing a linen bag through a sunny window. You can be soothing and caring when you speak to people. You enjoy learning about health and healing. Sun 03° Taurus 57' 38"
Moon 06° Capricorn 03' 20"
Mercury 09° Aries 38' 28"
Venus 04° Aries 33' 08"